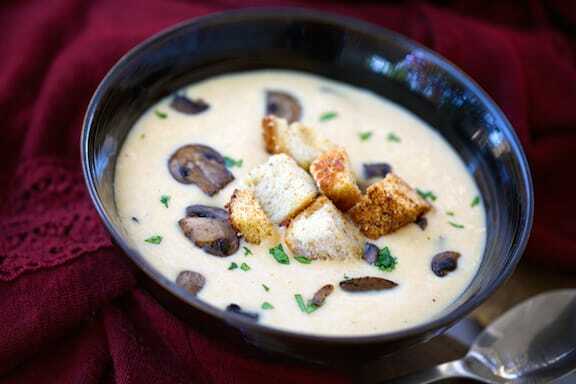 Pureed tofu or white beans make a low-fat but rich-tasting base for a soup sure to please mushroom enthusiasts. 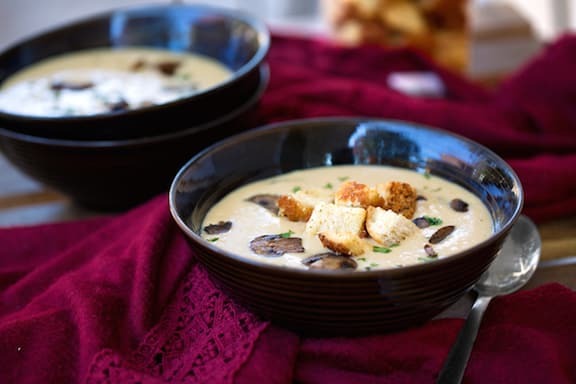 This comforting soup is a great first course for most any kind of meal or can be served side-by-side with sandwiches and wraps. Use leftover soup as a delicious Stroganoff sauce for pasta. Photos by Hannah Kaminsky. 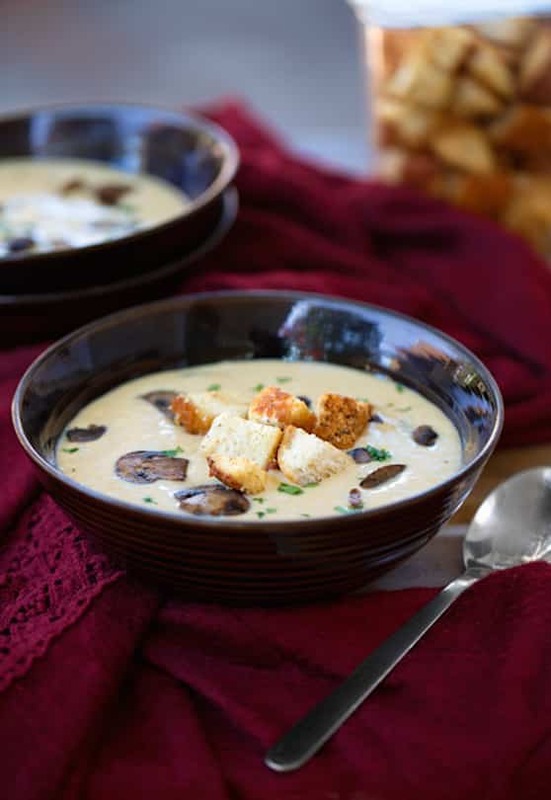 Pureed tofu or white beans make a low-fat but rich-tasting base for a soup sure to please mushroom enthusiasts. Heat the oil in a small soup pot, and add the onion. Sauté over medium heat until the onion is golden. Add the garlic and continue to sauté until the onion is very lightly browned. Pour in 1 cup of water and the bouillon cubes. Bring to a simmer and cook until the bouillon cubes are dissolved. Transfer the onion mixture and a little of the liquid to a food processor or blender. Add the tofu or beans and process until smoothly pureed. Set aside until needed. In the same soup pot, combine the mushrooms with whatever water remains in the pot. Cover and cook until the mushrooms until tender, about 8 minutes. Transfer the mixture from the food processor back to the soup pot and stir to combine with the mushrooms. Add the nondairy milk, more or less as needed to make a slightly thick base. Heat gently, especially if using silken tofu — you don’t want to bring this to a boil, or even a rapid simmer, as the tofu will curdle. Once the soup is hot, season with salt and pepper. Serve at once, or, if time allows, let the soup stand off the heat for an hour or so, then heat through as needed. Garnish each serving with parsley or basil, if desired, and if you'd like, pass around some croutons. Would it be ok to substitute plain soy milk or homemade almond milk for the boxed rice milk? The only boxed plant milk I can find without all the synthetic vitamins and chemical additives is plain soy milk. Susan, you sure can, and I updated the recipe to reflect that you can use any variety of nondairy milk you’d like, as long as it’s unsweetened. Where you say water in the recipe instructions you mean the non dairy milk, correct? Thanks!